BBC World Service - Assignment, Macedonia: What’s in a Name? The name Macedonia is disputed by two nations. Lake Prespa is bordered by Greece and the Republic of Macedonia but their disagreement means they cannot reach each other’s shores. 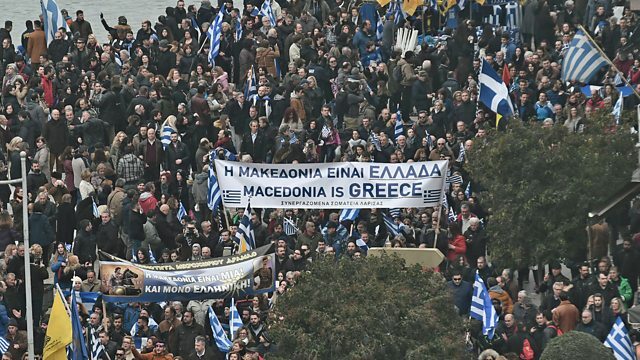 The name Macedonia is hotly disputed by two neighbouring nations. The Greek province of Macedonia and the country calling itself the Republic of Macedonia border Lake Prespa. The villagers on the lake’s shores share a language and a culture, but it is impossible to cross or drive around the lake because of the dispute with Greece over the Republic’s name. After years of stalemate, the governments of the two countries have agreed on a new name - the Republic of Northern Macedonia. But this has sparked angry protests by nationalists on both sides of the border. As The Republic of Macedonia prepares to hold a referendum on its name on 30 September, Maria Margaronis visits both sides of the lake to find out why this issue is so contentious - and how a painful history is being exploited by the far-right, politicians, and other interests on both sides. What do local people - and the lake stand to gain once the dispute is settled? And what is holding them back?